Guy Krause gets the chance everyone desires. 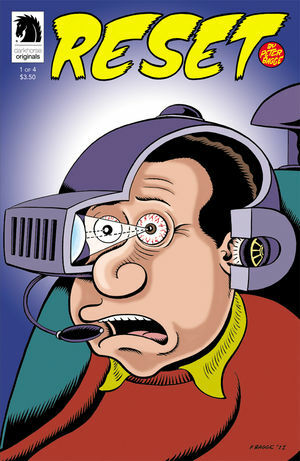 In Peter Bagge’s “Reset,” Krause gets another shot at, life. It is pure movie style comic bliss. Washed up comedian Guy Krause’s life couldn’t be any worse. His career is over due to a scandal, his wife left him and he can’t find regular work. In a DUI class he meets Angela Minor, a researcher who tells him her company made a device that can allow him to relive his past. It can also help him try to change it too see how different his life would’ve been if he’s done things differently. The story plays out exactly how you’d think it would. Krause at first is hostile towards the entire experiment and then he uses the machine more for his own pleasure than to change his past. This causes a lot of discontent between him, Angela and the rest of the people involved in the experiment. Bagge’s story is like a comedy with some kind of morale attached to it (think “Click.”) The only difference here is that the characters are actually well thought out and are closer to real people. Combined with solid dialogue that brings out each characters personality, you have the recipe for a strong story. The only minor complaint is that it ends exactly how you would expect it to. The instance one of Krause’s major life’s events is introduced, Bagge spends a great deal on it. The reader knows that this will become a major plot device later on. Even the resolution is exactly how you’d think it is. The comic looks very much like your typical newspaper funnies comic. The characters have that super cartoony look, with the super stretched limbs that curve instead of bend and heads that have everything round. This style fits perfectly with the comedic tone of the story. It brings out all of the ridiculousness of the character’s actions and lines. If it were done with a more serious art style, it wouldn’t work. “With the predictable, but fun story and whimsical art, Reset” binds all its ridiculousness perfectly.